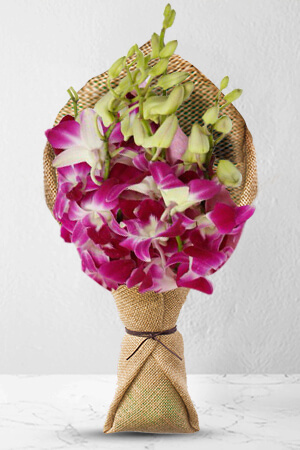 This fantastic bouquet of exotic Dendrobium Orchids alludes to the mysteries of the orient. This stunning and elegant bouquet will work beautifully in a corporate environment or as a point of interest at home. Our bouquets do not include a vase. However, for a lasting impression, we recommend a Premium Vase to complement Singapore Girl. Delivery did not occur on the correct day. Good range of products, nice specials and easy to order. Promptly delivered. My best friend had to say goodbye to an elderly friend who was moving O/Seas. The circumstances had shattered her, however, with these beautiful flowers that she received her loss was less painful. At the end of the day the flowers also reminded her she has many friends and she will be never be alone. It was 41C when the flowers were delivered and the recipient was out. The flowers were left in a bucket of water at the back of the house. Thank you! Excellent service and quality blooms. I have used zFlowers.com before and found them so good. Thank you. Easy, fast, efficient. Doesnt get any better.